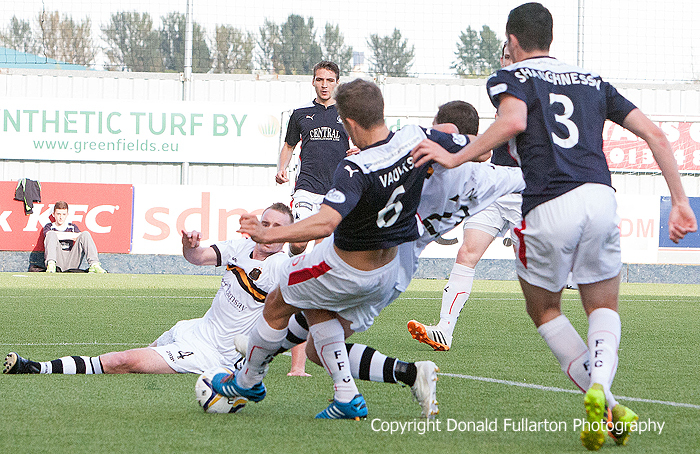 A 90TH MINUTE goal gave Dumbarton a share of the spoils at the sunlit Falkirk Stadium. A fine run by sub Steve McDougall ended with a low cross which Chris Kane stabbed into the net from close range with almost the last kick of the ball to give Sons a deserved point. Falkirk, managed by former Sons striker Peter Houston, took the lead in only four minutes when Craig Sibbald beat keeper Danny Rogers, and the Bairns remained in charge throughout the first half without looking likely to increase the lead. As the second half processed Sons came more and more into the game, inspired by a magnificent fingertip save from Rogers. In the final minutes they looked desperately for a goal, and it nearly came from a Chris Kane effort and a shot by Colin Nish. However with 90 minutes on the clock the on loan St Johnstone striker tapped home (pictured) to spark wild celebrations for his team-mates and the travelling Sons fans.